"Love everyone at the Wellington Branch! They all know me by my name and are so welcoming when I walk in or go through the drive-thru! So happy I have banked here for the last 2 years. Even going to Ohio State they helped point me in the direction of finding somewhere I can do shared branching at near school!" If you tend to keep a balance or are looking for a better rate, this is the card for you! Transfer balances over from other high-interest credit cards to the Great Rate card to save time and money. New card holders: receive a 1.99% introductory APR* on balance transfers made within 60 days of card activation and a $0 balance transfer fee! Remember, we’re not just for Firefighters! Joining FFCCU is easy and offers you all kinds of perks including the opportunity to earn interest on a checking account! We also offer online banking and have our own mobile app! You can learn more about becoming a member here. Great Rate and Most Rewards cardholders can now register their mobile device and email to receive Visa Purchase Alerts. Cardholders are able to choose the notification triggers that match your needs, such as transaction exceeding a set amount. *Rate is good for 12 months after first balance transfer occurs. 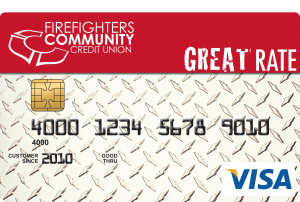 Only balance transfers from within 60 days of card activation are eligible for 1.99% APR with $0 transfer fee. Offer applies to balances transferred from non-FFCCU cards only. After the introductory period ends, the Variable APR applies. The 1.99% APR applies to balance transfers only, not new purchases. Learn about our VISA Credit Card Rates and Interest Charges here.